Banh da Lon (P20). Vietnamese sapin sapin, made of pandan and monggo beans. Vietnam is a hot tourist place these days because of its cultural sights, cheap shopping places and interesting Vietnamese cuisine. However, I’ve never tasted Vietnamese cuisine similar to the one you enjoy in Vietnam. I’m glad that Yong and Virgilio Tatlonghari decided to open their lovely home for weekend dining. 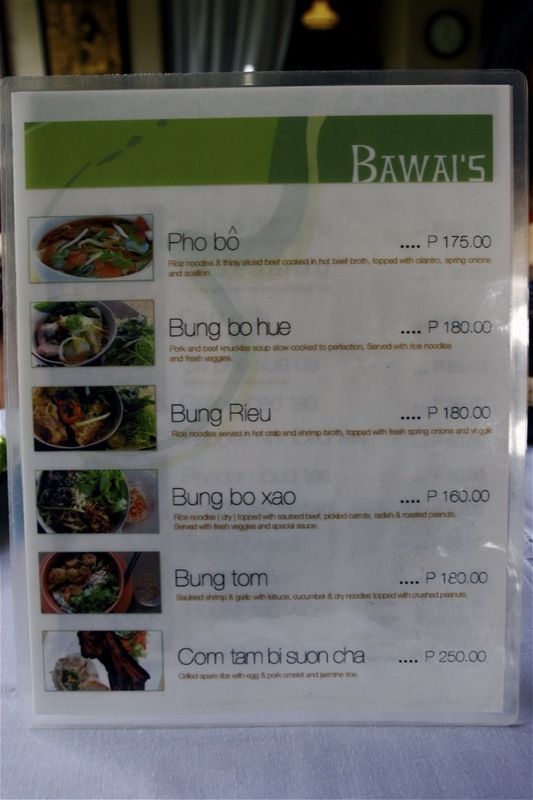 Bawai is a 4 month old Tagaytay Vietnamese restaurant which serves close to authentic home cooked Vietnamese food. Yong, called Bawai (grandma in Vietnamese), is the person behind this refreshing new restaurant. I would highly recommend the fresh spring roll and just about anything with the special sweet patis sauce. Also, they don’t get a lot of guest lately so they will entertain you as their own guest. You need to reserve and order in advance since each meal is cooked by Bawai herself. I do hope it remains that way, and the food don’t get commercialized like most Vietnamese restaurants in Manila. The secret to Bawai’s food is authentic imported ingredients from Vietnam sent by Bawai’s friends and relatives. So next time you are in Tagaytay, be sure to check out this hidden Vietnamese treasure..
LA PETITE CAMILLE: American Vietnamese Cuisine with a Dash Of Joie De Vivre? We got oriented with the Vietnamese way of calling grandma and grandpa. It is similar to the respect given by the Chinese. If the grandpa and grandma belongs to the wife side, the grandkids would call them Ba Noi and Ba Wai respectively. If they belong to the husband side, the grandkids would call them Ong Noi and Ong Wai respectively. Don’t be surprised if Bawai’s accent is kinda Visayan and she has a funny way of speaking Tagalog. She migrated to the Philippines in 1972 and recently they decided to retire in Tagaytay. Bawai — Thanks so much for the wonderful meal!!! You should see Bawai on your left. The dining area is in the second floor and if you are the only guest, you can park inside the garage. Above is the dining and sala area of the house. Please reserve and order in advance (see menu below). I just remembered, Sonya’s just started with a small dining space like this, until she was able to buy the nearby lots. Side Order and Desserts — The Best!! Goi Cuon (P125) Vietnamese Fresh Lumpia – fresh noodles, shrimp, pork and veggies wrapped in Vietnamese rice paper, served with special sauce (3pcs. per order). I love the fact that the shrimp seems to be bursting out of the lumpia skin. This is my wife’s choice every time we go to a Vietnamese restaurant because she feels this is one healthy dish. Highly Recommended. We love the sweet peanut sauce that comes with this! We love this fried spring roll instantly, never mind that it is fried! =) This is way better than Cha Gio’s spring roll. By the way, we love the special fish sauce that came with it, it was enough for me to really soak my spring roll into this and even with the cucumber and the greens! Yummy sweet patis sauce! Can’t stop asking for more. Pho Bo (P175) Rice Noodles & thinly sliced beef cooked in hot beef broth, topped with cilantro, spring onions and scallion. Devour this while hot because you’ll know why if you don’t. The soup itself is already tasty so adding the lemon will make it a little zestier and the dark brown sauce and red sauce (we forgot to ask what it was) more tastier. There was a generous serving of beef slices was all over the soup. However, they could improve on the quality of beef that they use. Bung Bo Xao (P160) Rice noodles (dry) topped with sauteed beef, pickled carrots, radish and roasted peanuts. Served with fresh veggies and special sauce. This is the actual look of the dry noodles topped with beef which you cannot see from the bowl above. Again, we made use of the special fish sauce to put taste on the rice noodles. I just loved the sauce. What would happen if they run out of this special sweet fish sauce? The beef was kinda hard still..
Ca phe sua da (P55) Vietnamese iced coffee with milk. This is a must try if you are into cold coffee drinks! This is one interesting comment in Bawai’s Guestbook…. Aidan standing on a Vietnamese rocking chair with the whistle given by Ba Noi. Thanks so much for this! The garden is still not yet developed and I won’t be surprised if one of these days we would see a nice landscape garden here. Thanks for the tip, Anton. I’m having a bit of a Vietnamese food craving nowadays. Look forward to making the trip soon. hi anton, i read your blog regularly but rarely leaves a comment. i’m always awed by the travels and the food that you feature every now and then. keep it up!!! i just can not help but smile a little on the title of this post as it sounds a little bit funny. educate me if im wrong, but isn’t it that “vietnamese” is a term use to refer to people from vietnam? should you use this term to refer to something else from that country, the thing that you are referring to should be put right after. anyhow, i wanna try this place too as i really love vietnamese food!!! am an avid reader of your column. 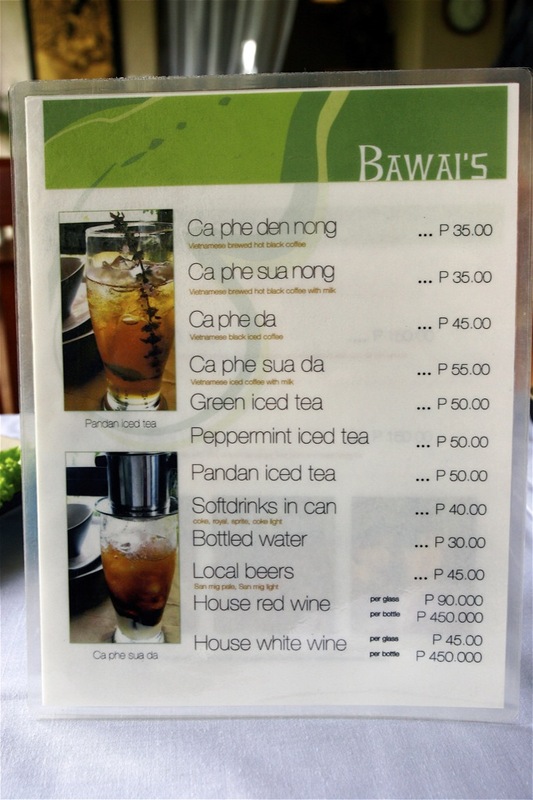 i will surely try bawai but i would like directions to sonya’s garden in tagaytay. we just bought a quadrille at crosswinds in tagaytay and i need more info on places to go and things to do in tagaytay. thanks. Anton,the brown sauce that’s served with the Pho Bo is Hoisin sauce. Thanks for sharing this fabulous cuisine! the best talaga si anton sa paghanap ng best keep secrets! of course, i mean “lots”, hehe! Hahaha! You were short of saying, they could have used Wagyu Beef for their Pho hehehe. What’s up Anton. Anyways, another place to check out in Metro Tagaytay, thanks Bro. Last year, I’ve lost like 12 pounds by eating Pho like a tleast 4 times a week plus a little running and pick up games. Thanks for this, will try this one out on our next Tagaytay sojourn. Hope to see you and your family in your next visit. Great find! First time to comment, love your blog. You always have a knack for discovering the best restaurants. Will definitely swing by this one next time I’m in Tagaytay. BTW, your pics are so mouth-watering. Thanks for another wonderful tip. hi anton, this is liz, eldest daughter of bawai / dung & ver tatlonghari…we can not thank you enough for the kind words and good review…moreso, for discovering bawai’s…my parents are very delighted that you really enjoyed your vietnamese experience. and to the rest who posted their good reviews, thank you so much and see you all again soon. We brought our kids and some guests to Bawai’s yesterday. We loved the place and the food – although, I must say, it would have been better if they had more options for strict vegetarians. We lingered way too long because of the great coffee, desert, ambiance and weather. Thanks, Anton, for the wonderful discovery. We plan to go back very soon. Do they serve dinner of just lunch? 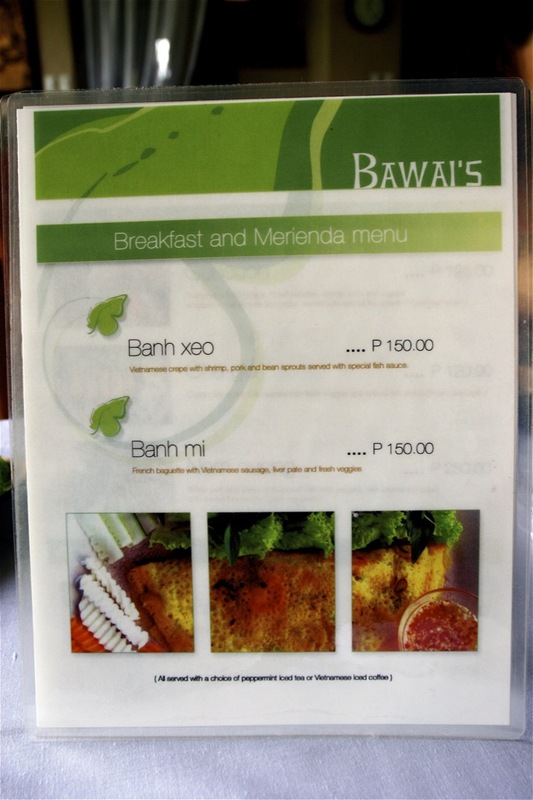 We went to Bawai last December 26 2009 upon OAP’s recommendation. The experience was horrible. One of their attendants didn’t even greet us nice and immediately asked if we have a reservation. When I said yes she confirmed with an old woman in the kitchen and she went out and said we had none. I started to get pissed off (considering we traveled all the way from Manila just to eat there) and looks like one of their waitresses noticed and they decided to give us the seats we reserved (we did the reservation a week ago with their sms confirmation). Food was not that great to rave about. We think that most of Manila’s Vietnamese restos do better. I also noticed that the old lady (whom I think was Bawai) wore a face that looks sooo tired of what she does. She kept on walking in and out of the kitchen with that face which looked like her customers owe her for her cooking (which I repeat was not that Oh so good). We stayed at Chateau Hestia, which was also recommended by OAP. Our stay was fantastic! Food was great….everything was superb! my family and i tried bawai last jan 24. my mom has been trying to get a reservation for us for as long as i can remember, and we’re just glad we’d be able to try authentic vietnamese dishes very soon. Then came our food. All I can say is that the food they served us all tasted the same and were all bland. They charge really high per dish (around 250-400) and they can’t even make their food decent enough to compensate with the prices of their food. The serving is good enough only for one person and the presentation was very amateur. After leaving bawai’s, I felt like I was robbed of my hard earned money. Thanks for taking the time to comment about your experience. It is sad to hear that the quality in Bawai is degrading recently… Thank you for this sharing your experience so that other people will be forewarned about going here. I would agree with you that no one deserves this kind of experience. Hi Nico, my apologies regarding your experience in Bawai’s – it was just probably one of those bad days. Rest assured we are doing our best to improve things. We respect your comments. Thanks. Hi Therese, we usually provide mint for the pho bo – we must have ran out on mint, basil and lettuce that day but in most days our kitchen is complete w these ingredients, our apologies for that. We adjusted our price recently because of the price increased from our suppliers, but rest assured we’ll review them again. We respect your comment. Thank you. Hi Nico, my apologies for your experience in Bawai’s – rest assured we will do something with our reservation system. We respect your comments. Thank you. Hi Michael, thats true the restaurant is originally our weekend home and yes thats our sala 🙂 we just converted our place to a small restaurant because of the numerous request of of our friends and family to set up a Vietnamese restaurant. My apologies for the hot pandan tea and if you find the food bland, and since you felt like you were robbed of your hard earned money, let us pay you back if you can provide us a copy of your receipt. We respect your comments. Thank you. hi, the recent posts makes me sad…my family & i were just there recently and we did love the food…the hosts were gracious and accomodating. we checked this place because we read it here and we were not dissappointed. we hope they will be able to address the issues posted. we hope to come back soon. I think comments should be subjective and we shouldnt make a decision based on other peoples negative or positive comments… Taste depends on the one tasting and good service also depends on the time and the one actually experiencing it, at a given time. I went there two weeks ago with fellow expats from Makati and must say that the food is really good and if your familiar with the Authentic Vietnamese dishes (From Ho Chi Minh City) and not compare it with the commercialized Vietnamese restaurants in the Philippines then you know what I’m talking about. Hi Karen & Christine, thank you very much for your comments…We at Bawai’s are trying our best to address the issues stated above. We are inspired by them and rest assured that we will take into consideration everything that was mentioned. We value and respect all the comments and hope to improve to serve you all better in the coming days. Again, our heartfelt thanks on behalf of Bawai & Amwai. And to Nico, Therese & Michael, please accept our sincere apologies to all inconveniences that you have experienced in Bawais…We respect your comments and rest assured that we are addressing your issues. We hope to have a chance to serve you better in the coming days. Thank you all & God bless. we were there in april 2010…food was fantastic…we enjoyed everything we ordered…from salad, fish, prawns..fresh spring rolls & the yummy dessert…sorry i can not remember the names of the food…too bad for you..u didnt enjoy the food..
and by the way…the price we paid, we felt its so CHEAP!!! 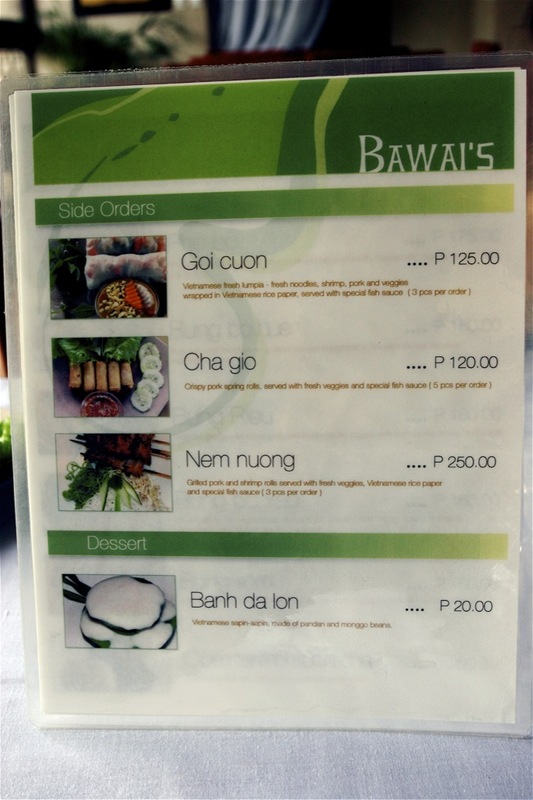 i ate in ba wais a few months back to try their vietnamese food. for someone whose tastebuds have been accustomed to true vietnamese flavors, i must say the food that they served does not fit the description people rave about. it was bland and not as authentic as i was expecting. while we were having our lunch, we found out the owner was a good friend of my parents way back. and she admitted to us that she had to alter the flavors to please the taste buds of the filipinos. it was no wonder my tastebuds were not pleased. its disappointing to know she had to sacrifice authenticity to please the stubborn palettes of filipinos. we need to be exposed to all types of cusines and learn to appreciate and respect their flavors. Hi Liza, Is there a new number we can call to reserve for this Sunday August 29, 2010. Want to try this restaurant but walang sumasagot sa numbers. Sayang, we’re supposed to go tomorrow pa naman. Are they open for dinner? Yes they are open for dinner but on a by reservation basis. Disappointed with this place. Our hosts in the Philippines have been raving about this place and had a one month reservation for us. En route to Tagaytay, we found that they gave our reservation away, and even surprisingly blamed our hosts for not confirming the reservation. My wife took the phone from our host and heard the person on the other end shouting at her – which shocked us. So we expressed that they had very bad service – very rudely, the man on the other end said ‘OK no problem’ and hung up. This was such an appalling experience. They may have good food, but I’m sorry I am not recommending this place to any friends. Thank you for your post. I am very happy to see my country’s food is so favored here in The Philippines. I would love to go to this place if I go to Tagaytay. So, briefly, If the grandpa and grandma belong to the wife side, the grandkids would call them Ong Ngoai and Ba Ngoai (or Wai) respectively. If they belong to the husband side, the grandkids would call them Ong Noi and Ba Noi respectively. You may want to try Com Tam Suon Bi Cha, if Bawai makes it with the right rice and right fishsauce, it’s irresistible!